An abandoned fish caught through blast fishing sequestered in San Roque fish port. Tabaco City Fish Examiner Daryl John O. Buenconsejo examines a fish sample was tested to be positive for dynamite blast as it has exhibited damaged vertebrae. Tabaco City, [07.17.18] – An illegally caught fish believed to be gathered through blast fishing was intercepted by local Bantay Dagat, Coastal Rangers of Albay and PNP Maritime Group in Tabaco City this morning. 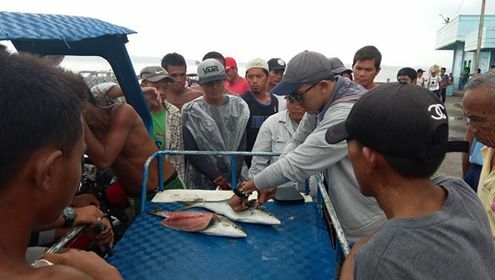 The illegally caught fish particularly the pelagic Rainbow runner, also known as the Rainbow yellowtail, Spanish jack, Hawaiian salmon or commonly known in Bikol as “Bulangawan” and other species was seized at the San Roque port at around 8:00 o’ clock this morning. The apprehended fish has a total weight of 47 kilos and a fish sample was tested to be positive for dynamite blast as the tested sample has exhibited damaged vertebrae, Tabaco City Fish Examiner Daryl John O. Buenconsejo said. Elements of PNP Maritime Group – Tabaco, Bantay – Dagat Tabaco City and Coastal Ranger of Albay// PNP Maritime PO3 Ruel Lumbis, PO2 Rey Anunciado, City Agriculture, Elmer Bien, Jonel Abrera, Fish Examiner Daryl John O. Buenconsejo, Albay Coastal Ranger and Bantay – Dagat Tabaco City intercepted the abandoned fish. According to the authorities, an informant had informed them that an illegally caught fish will be delivered to a Tabaco City–based buyer and will be unloaded in the San Roque Fish port. The fish came from San Miguel Island but nobody owned the shipment when apprehended. Under Section 88 of Chapter VI of Republic Act 10654 the dealing in, selling, in any manner disposing of, for the profit of illegally caught/gathered fishery species shall be punished by imprisonment ranging from six months to two years.